Sales Enablement Materials | Clarity Innovations, Inc.
Providing years of trusted expertise on the K-12 market: sales and marketing meetings, white papers, case studies, presentations, and dynamic web tools. Lacking the subject-matter expertise and direct K-12 teaching and administrative experience necessary to sell confidently in the education market, the Public Sector group of a Fortune 100 technology company needed an organization that could help train their staff on the ins-and-outs of the K-12 market. Moreover—as part of their shift from selling products to selling comprehensive solutions—the group also needed a partner who could function as an extension of their team: conducting professional development experiences, presenting webinars and conference sessions, and providing sales enablement information, content, and tools to help Intel “change the conversation” with their prospective customers. The design, content, engineering, and strategy teams at Clarity have worked have closely with this group since 2010 to help “skill-up” their team during internal sales and marketing meetings: developing numerous white papers, case studies, and presentations while working as an extension of their team to help dramatically increase their market segment share. 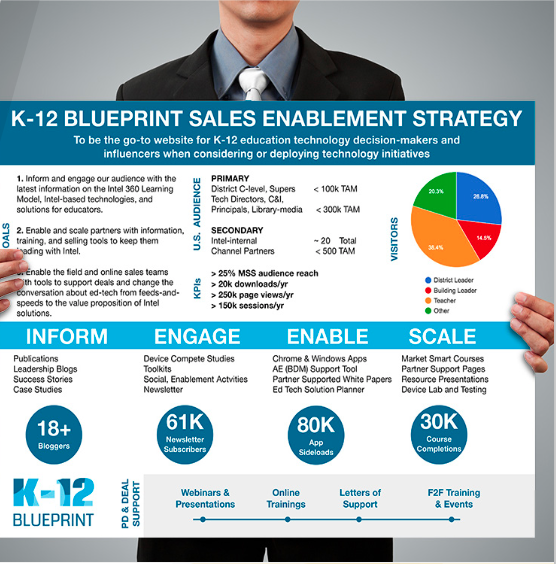 Clarity used the K-12 Blueprint website as one of the primary tools to influence both education device and solutions sales by creating deep wells of content and supporting materials heralding the value of their education solutions.